The Rio Grande flows through a sizeable gorge for the first 78 miles of its journey through New Mexico, from the Colorado border as far as Velarde, southwest of Taos, where the cliffs recede. The first 50 miles is a National Wild and Scenic River, the first area in the US to be so designated (in 1968), and cuts through remote, volcanic land - a flat lava plateau dotted with the black cones of long extinct volcanoes, generally deserted and undeveloped. 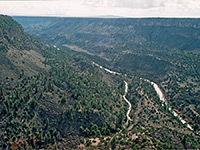 Most is accessible only by unpaved tracks that run to or along the canyon rims, apart from the deepest part of the gorge west of Questa, which is part of the BLM-managed Wild Rivers Recreation Area, where a paved road runs alongside the Rio Grande for 7 miles and ends at a narrow promontory above the junction with the smaller Red River. This flows westwards from the Sangre de Cristo Mountains and its lower end is also contained within a deep canyon, joining the Rio Grande 800 feet below the plateau. The recreation area is part of the new (created 2013) Rio Grande del Norte National Monument, which includes the river gorge southwards to the confluence with Rio Fernando del Taos, and a large area of plains and volcanic peaks to the northwest, as far as the Colorado stateline. From the east, the approach road is highway NM 522, from Taos through Questa and on into Colorado. Three miles north of Questa, a smaller road branches off westwards, thorough the run-down village of Cerro and into open land towards the river. The 13-mile road crosses a level plain, covered with dark colored sagebrush bushes and with the flatness interrupted only by a few rounded volcanic hills, though a line of basalt cliffs in the distance mark the course of the Rio Grange gorge. From the west, the only road crossing the river for 40 miles south of Colorado is US 64 from Tres Piedras, a busy highway that bridges the gorge 650 feet above the river, from which the Recreation Area is a 45-mile drive away, to Taos then north along NM 522. The scenic drive turns south, following the rim but staying a few hundred feet from it, passing several roads to viewpoints/recreation sites including Sheep Crossing and Chiflo, where short paths lead right to the edge. The top part of the canyon is defined by sheer, 100 feet high basalt cliffs, then below the gorge is V-shaped, its sides formed by scree slopes, without any vegetation apart from scattered bushes around the river. The waters flow swiftly across many rapids, some graded up to class VI. After the entrance station (fees $3 per vehicle in 2013), the road ends in a loop, accessing various trailheads, more overlooks, five campgrounds and a visitor center. The most spectacular overlook is La Junta Point, high above the Red River and the Rio Grande, and also the site of the most popular campsite. Big Arsenic Trail; one of three rim to river routes near the confluence, this drops 680 feet over 0.8 miles to a primitive campground close to the Rio Grande. Guadalupe Mountain Trail; a 2 mile (one-way) path across the lava plateau and 1,000 feet up the pine wooded slopes of Guadalupe Mountain, giving great views of the surrounding area. La Junta Trail; steep, rocky route to the confluence of the Rio Grande and Red River (see below). Little Arsenic Springs Trail; another short but testing path from the canyon rim to the Rio Grande. Red River Fault Loop; a 5 mile circular trail across level land beneath Guadalupe Mountain, though pinyon-juniper woods and across sagebrush flats. This is primarily a mountain bike route. Rinconada Loop; a level, 6 mile trail through woodland along the canyon rims, running quite close to the park road. The best trail in the Wild Rivers Recreation Area is the route to the confluence, starting at the southern tip of the plateau between the two rivers, at La Junta Overlook. From here, the path descends 800 feet over 1.2 miles, firstly down the near-vertical upper cliffs, where it is aided at one point by stairs and a short ladder, then by switchbacks down the steep boulder-filled slopes below. The base of the cliffs can be reached in as little as 15 minutes, at which point the trail divides; the actual river junction is 0.4 miles further along the left branch, along a low ridge between the rivers. The far end has several shelters for primitive camping, before the trail meets the river's edge. A footbridge crosses Red River and another trail continues downstream on the east side of the Rio Grande, just above the jumble of black, water-polished boulders that line the river banks. The hike to this point is short - it can take just 90 minutes to descend, explore the area then return - but enjoyable, testing and scenic. 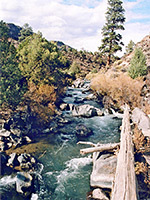 The nearest towns with hotels close to the Wild Rivers Recreation Area are Red River (21 miles) and Taos (33 miles).